Materials: Arched flamed maple laminate top, back and sides; solid mahogany neck with adjustable truss rod; solid Amazon Rosewood fingerboard; 7-ply bound body; triple bound headstock. Hardware: All nickel hardware includes Sadowsky humbucking pickups: compensated Tunematic style bridge and stop tailpiece; Schaller tuners with ebony buttons; master volume and tone controls; 3 way pickup selector switch. Solid ebony pickguard and bracket included. This stunning example is finished in a handsome amber blonde finish, and shows particularly intense flame maple throughout. At just over 6lb. 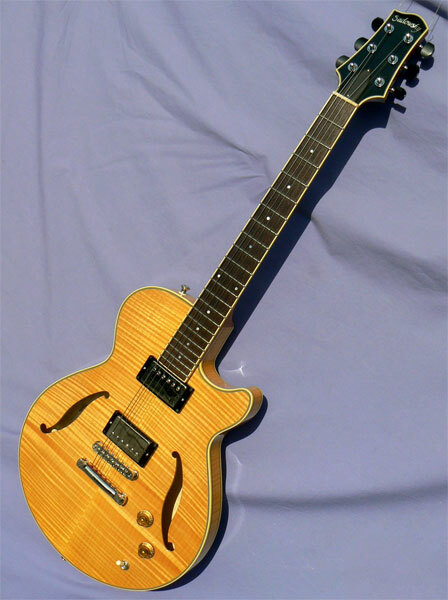 the guitar is notably lightweight, and the mahogany neck makes for exemplary balance on the lap or the strap. The instrument has been immaculately maintained in 100% original condition, without pick, buckle, thumb or fingerboard wear. The hardware is nickel plated for a true vintage look, and the instrument appears virtually unplayed. A factory ebony pickguard and bracket are included as well. Setup: This instrument is strung with medium gauge (.012-054) flatwound nickel strings. The guitar will accommodate lighter or heavier gauge strings, according to preference. String action is set at 4/64" to 5/64" at the 12th fret, with moderate relief for acoustic playing with medium strings. The action may be lowered or raised to your requirements with the adjustable bridge.